microRNAs (miRNAs) are small single-stranded non-coding RNAs that act as crucial regulators of gene expression. Different methods have been developed for miRNA expression profiling in order to better understand gene regulation in normal and pathological conditions. miRNAs expression values obtained from large scale methodologies such as microarrays still need a validation step with alternative technologies. Here we have applied with an innovative approach, the Luminex® xMAP™ technology validate expression data of differentially expressed miRNAs obtained from high throughput arrays. We have developed a novel labeling system of small RNA molecules (below 200 nt), optimizing the sensitive cloning method for miRNAs, termed miRNA amplification profiling (mRAP). The Luminex expression patterns of three miRNAs (miR-23a, miR-27a and miR-199a) in seven different cell lines have been validated by TaqMan miRNA assay. In all cases, bead-based meas were confirmed by the data obtained by TaqMan and microarray technologies. We demonstrate that the measure of individual miRNA by the bead-based method is feasible, high speed, sensitive and low cost. The Luminex® xMAP™ technology also provides flexibility, since the central reaction can be scaled up with additional miRNA capturing beads, allowing validation of many differentially expressed miRNAs obtained from microarrays in a single experiment. We propose this technology as an alternative method to qRT-PCR for validating miRNAs expression data obtained with high-throughput technologies. MicroRNAs (miRNAs) are endogenous 18-24 nucleotides (nt) long noncoding RNAs (ncRNA) that control gene expression by targeting mRNAs and triggering either translation repression or degradation. The degree of complementarity between a miRNA and its mRNA target determines, at least in part, the regulatory mechanism . Recently, a third less understood mechanism of small RNAs interference on gene expression involves heterochromatin silencing . Many miRNAs are highly conserved among animals and plants  and it is estimated that up to 33% of all mRNA coding genes are negatively regulated by miRNAs [4, 5]. miRNAs exhibit temporally and spatially regulated expression patterns during diverse developmental and physiological processes and clearly animals cannot survive without miRNAs [6, 7]. Most of the miRNAs that have been characterized so far in animals seem to regulate developmental processes, including larval stage transitions and neuronal development in C. elegans, growth control and apoptosis in Drosophila melanogaster or haematopoietic differentiation in mammals. Many miRNAs have been found to display unique tissue , developmental stage  or disease-specific patterns . These observations imply that each tissue is characterized by a specific set of miRNAs that contribute to the definition of the features of that tissue. Hundreds of novel conserved and non-conserved microRNAs have been identified by bioinformatic analyses, suggesting that the total number of human miRNAs could reach 1,000 . According to recent computational predictions, as many as 200 mRNAs can be regulated by a single miRNA, which implies that over one third of protein-coding genes in humans are regulated by miRNA [14, 15]. So, the ability to monitor changes in miRNAs expression is important for understanding gene regulation both in physiological and pathological conditions. 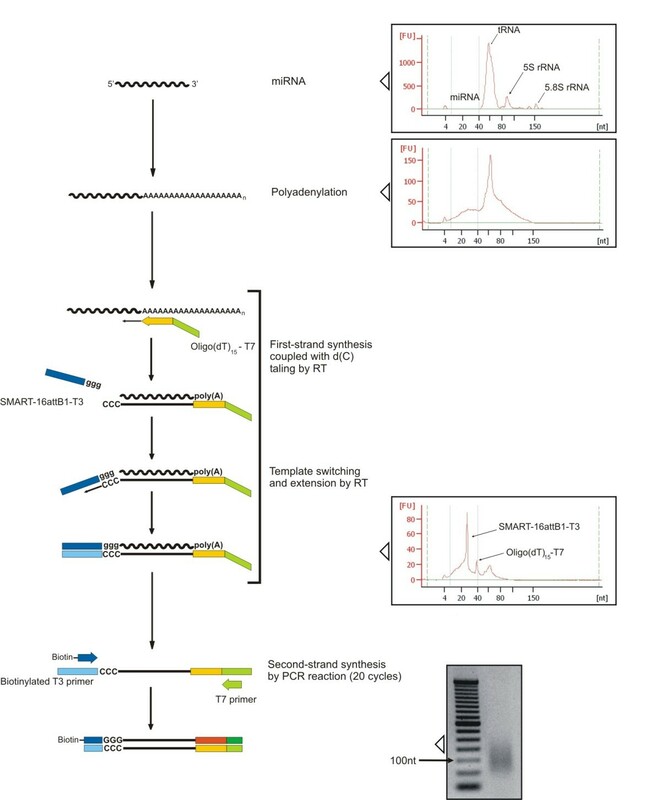 Several methodologies have been adapted for profiling miRNA expression: northern blotting with radiolabeled probes [16, 17], cloning [18, 19], massive parallel signature sequencing (MPSS) , quantitative PCR-based amplification of precursor  or mature miRNAs , SAGE-based techniques , bead-based profiling methods [24, 25] and oligonucleotide microarray . Microarray technology has been successfully used for evaluating variations of miRNA expression during development [27, 28], differentiation , oncogenesis [30–32], disease progression [33, 34] and for the primary identification of new miRNAs that were predicted by bioinformatic approaches [35, 36]. However, at present, no standard methodology exists for hybridization-based profiling of miRNAs and, as a consequence, comparison of expression data from different experiments can be difficult. To solve these problems it will be necessary to develop quality procedures for miRNA microarrays. Furthermore, miRNA expression obtained from high throughput arrays has to be validated with alternative technologies. Quantitative real-time PCR (qRT-PCR) has become the golden standard of miRNA quantification because it offers the highest sensitivity from small amounts of starting material and it is able to detect as less as 1-nt difference between miRNAs. Another interesting method is the Luminex® xMAP™ system that is a multiplexed microsphere-based suspension array platform capable of performing and reporting up to 100 different analyses in a single reaction vessel [37, 38]. In particular, oligonucleotide-capturing probes complementary to miRNAs of interest are coupled to carboxilated 5-micron polystirene beads impregnated with variable mixtures of two fluorescent dyes, each representing a single miRNA. Using this technique Lu and colleagues  were able to differentiate tumours that were instead inaccurately classified by mRNA profiles. Recently, a study performed with Luminex miRNA platform, identified new markers of human breast cancer subtype . When compared to glass-slide microarrays, the bead-based miRNA arrays show many advantages such as easy of use, low cost, superior statistical performance, faster hybridization kinetics (solution hybridization) and higher flexibility in array preparation. Furthermore, the Luminex bead array system has been used in a wide range of multianalyte applications throughout the drug discovery and diagnostics fields and it is also widely adopted for quantitative multiplexed protein expression analysis [40, 41]. In this study we have applied the Luminex® xMAP™ technology in a novel approach to validate expression data of differentially expressed miRNAs obtained from high throughput arrays. We have developed an innovative system for labeling of small RNA molecules (below 200 nt) optimizing the sensitive cloning method for miRNAs, termed mRAP, developed by Takada and Mano to define mouse miRNA transcriptional signature [19, 42, 43]. The expression patterns of three miRNAs (miR-23a, miR-27a and miR-199a) measured by our Luminex approach in seven different cell lines were validated by TaqMan miRNA assay. In all cases, the two technologies gave super imposable results. Our data demonstrate that bead-based detection of individual miRNA is a feasible approach, associated to high speed and low cost. The Luminex® xMAP™ technology is also feasible for multiplexing, since several beads prepared to capture different miRNAs can be added in the same reaction allowing the validation of many differentially expressed miRNAs obtained from large-scale approaches in a single experiment. Rhabdomyosarcomas (RMS) are rare but very aggressive tumours of childhood that arise as a consequence of regulatory disruption of the growth and differentiation pathways of myogenic precursor cells . Based on morphology, two major RMS subtypes can be identified: embryonal RMS (ERMS) and alveolar (ARMS). To better understand the global function of miRNA in RMS, we analyzed the expression profile of 7 different RMS cell lines (3 ARMS and 4 ERMS) using the mirVana miRNA Probe Set V1 (Ambion) that is a collection of about 400 amino-modified DNA oligonucleotides . Briefly, the miRNA population from a single cell line was compared to a reference sample consisting of a pool of the seven small RNA samples ( < 200 nt) mixed in equal amounts. The miRNA microarray platform was able to distinguish PAX3-FKHR positive (RH4, RH30) and negative RMS (RD, CCA, SMS-CTR, RH36, RH18) cell lines through the expression pattern of about 120 miRNAs (data not shown). Since the translocation positive RMS patients fared worse than the negative counterpart  our results demonstrated the potential of miRNA expression profiling to classify different RMS subtypes, in agreement to previous gene expression studies [47–49], and set the basis for a further functional characterization of selected miRNAs implicated in RMS pathogenesis and in the different clinical behaviour and aggressiveness of the two RMS subtypes. We decided to study miRNAs with the greatest difference in expression between PAX3-FKHR positive and negative RMS. So expression levels for three discriminant miRNAs (miR-23a, miR-27a and miR-199a) were validated by xMAP™ technology and TaqMan qRT-PCR. To prepare the capture probes, 21-23 bases-long oligonucleotides with sequence complementary to each of the three differentially expressed miRNAs (miR-23a, miR-27a and miR-199a) in RMS cell lines, were synthesized and coupled to different color-coded microspheres in separate reaction tubes and then mixed for multiplexed assays. The targets were oligonucleotides complementary to capture probes and tagged with biotin at their 5'-end. Capture probes (approximately 5,000 beads for each probe) were mixed in the same tube with targets at various amounts ranging from 15 amol to 300 fmol. Phycoerythrin (PE)-coniugated streptavidin was added to the reaction mixture to detect bound targets that were biotynilated. The signal of each target hybridized to its specific capture probe coupled to microspheres was determined by the fluorescence intensity of phycoerytrin. At least 100 microspheres of each set were analyzed by the Bio-Plex™ system to obtain a median fluorescence intensity value (MFI) that was representative of the whole population of each set of beads. As shown in Figure 1A, the hybridization signal for miR-199a with capture probe varied with the amounts of added target in a logarithmic trend, reaching a plateau when the targets were present at the highest concentrations. Furthermore, the specificity of hybridization did not change while increasing from 1 to 3 the number of different microspheres in the reaction. We have evaluated the stability of conjugated microspheres at regular intervals during 80 days after conjugation. The hybridization signal is stable up to 35 days. As shown in Figure 1A, the hybridization signal for the miR-199a slightly decreased with the distance from conjugation, but the hybridization between the capture probe and the corresponding target remained specific and proportional. Furthermore, our data show that it is better to use microspheres conjugated in the same day to correctly detect miRNA expression values. We have also represented the curve in a log-scale (Figure 1B) highlighting the linearity range of our technique: the lower limit of sensitivity is 0.073 fmol and the upper is 18.75 fmol. We have obtained comparable results with either miR-23a or miR-27a. 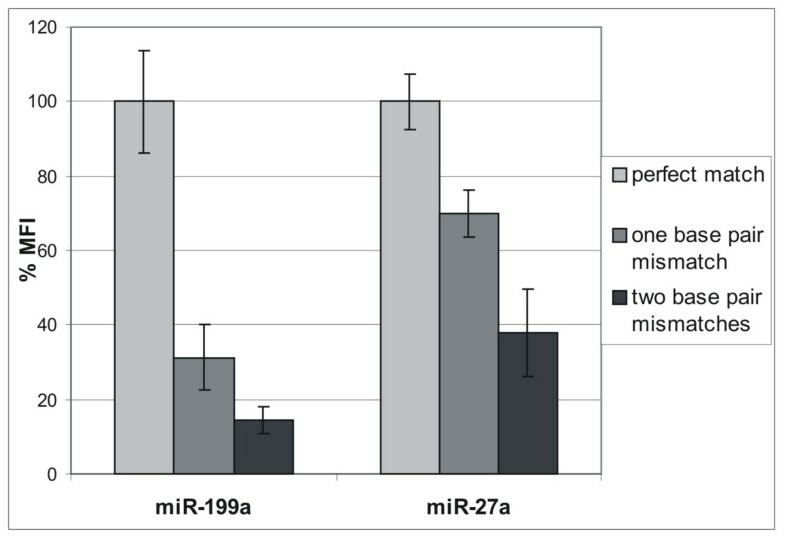 We measured the specificity of our technique by testing the variation in hybridization signal intensity when miR-27a and miR-199a are captured with probes that contain one or two mismatches in their complementary sequences (see Table 1). We have evaluated the signal of each target (biotynilated oligonucleotides perfectly complementary to mature miRNA sequence) hybridized to the correspondent capture probes with perfect match, one or two mismatches. As described above, capture probes were mixed in the same tube with targets at various amounts (from 15 amol to 300 fmol). Figure 2 shows that for both miRNAs we obtain a significant decrease of hybridization fluorescence intensity with capture probes containing a single mismatch. The signal drop is even greater with two mismatches: 62% for miR-27a and 85% for miR-199a. Stability of conjugated microspheres and sensitivity of hybridization. A) Increasing amounts of miR-199a target oligonucleotide (from 15 amol to 300 fmol) show higher fluorescence levels reaching a plateau when the target is present at high concentrations. The curve shows a logarithmic trend. We observed a slightly decrease of the hybridization signal at 50, 65 and 80 days after conjugation. B) Calibration curve (0-35 days) of miR-199a in a log-scale from 15 amol to 300 fmol. The two lines show the linear and plateau range of fluorescence levels representing by two different slopes: 0.94 and 0.15 respectively with R2 = 0.99. The linearity range of our technique is comprised between a lower value of 0.073 fmol and an upper value of 18.75 fmol. Mean value of expression and 95% confidence intervals are associated to each fluorescence value (MFI corresponds to Median Fluorescence Intensity). Specificity of hybridization between capture probes and miRNA targets. Biotynilated miR-199a and miR27a (bottom panel) were captured in solution by the corresponding probes with exactly matching sequences (light grey boxes) or with one (dark grey boxes) or two mismatched bases (black boxes). The fluorescence signal obtained by the hybridization of both the perfectly matching probes was set to 100%. The hybridization signal between both capture probes and the corresponding miRNA target shows a statistically significant decrease (p-value < 0.05) when one or two mismatches are introduced into the capture sequence. Hybridization experiments were obtained with 18.75 fmol of biotynilated targets that fall in the linearity range of our method as shown in Figure 1B. Mean value of expression and 95% confidence intervals are associated to each fluorescence value (%MFI corresponds to the percentage of Median Fluorescence Intensity). We have also determined the expression levels of above cited miRNAs, using the capture probes with perfect match, one or two mismatches in complex RNA populations obtained from seven RMS cell lines (RD, CCA, SMS-CTR, RH36, RH18, RH4, RH30) in comparison to a reference sample (Pool). As shown in Figure 3, we observe a decreasing trend in fluorescence signal for the capture probes with two mismatches. These experiments show that the specificity of a capture probe is proportional to the number of mismatches present in its sequence and that this specificity guarantee the correct quantification of miRNA expression levels in complex RNA populations. Specificity of hybridization between capture probes and miRNA targets in complex RNA populations. miR-199a (top panel) and miR27a (bottom panel) were captured from labeled total RNA populations prepared from 7 different RMS cell lines (RD, SMS-CTR, RH18, RH36, CCA, RH4, RH30) and a pool these RNA preparations mixed in equal amounts (POOL) with capture probes with exactly matching sequences (light grey boxes) or with one (dark grey boxes) or two mismatched bases (black boxes). The hybridization signal in all complex RNA mixtures between both capture probes and the corresponding miRNA target in comparison to the reference pooled sample shows a statistically significant decrease (p-value < 0.05) when one or two mismatches are introduced into the capture sequence. Mean value of expression and 95% confidence intervals are associated to each fluorescence value (normalized MFI represents the average of the ratio between the value of fluorescence of miRNAs and the spike). We have developed a new sensitive miRNA labeling method based on the mRAP strategy recently developed by Mano and Takada for miRNA cloning [40, 41]. This new procedure is described schematically in Figure 4. Small RNA molecules ( < 200-nt) purified by PureLink™ miRNA Isolation Kit (Invitrogen) were polyadenylated with Poly(A) polymerase (PAP). Complementary DNAs corresponding to the miRNAs were then synthesized with the use of reverse transcriptase and a RT primer, named Oligo-dT15-T7, complementary to the poly(A) sequences added to the miRNA. This RT reaction was allowed for 30 minutes in order to synthesize cDNA molecules of about 200 nt. We have used a degenerated oligo(dT) to reduce the length of the neo-synthesized poly(A) tails to 15 nucleotides. Given that some reverse transcriptases possess terminal deoxynucleotidyl transferase activity, the synthesized cDNA strands frequently result with small poly(C) overhangs at their 3' ends. After annealing a long 5'-adptor, named SMART-16attB1-T3, to such poly(C) overhangs, PCR was used to amplify the miRNA-derived cDNAs. Using a T3-biotinylated forward primer, we have obtained biotinylated cDNA that was detected with Phycoerythrin (PE)-coniugated streptavidin after hybridization reaction. Every step of this protocol was quality checked by Agilent Bioanalyzer 2100 and the resulting electropherograms are represented in Figure 4. Electropherogram analysis of the RT products have revealed two major bands of ~30 and ~40 nt that correspond to the 5'-adaptor (SMART-16attB1-T3) and the oligo-dT15-T7 primer respectively. The electropherograms also evidence the action of degenerated oligo(dT) that reduces the length of neo-synthesized cDNAs to 100-110 nucleotides by shortening the poly(A) to 15 nt (Figure 4). Schematic representation of miRNA labeling method for bead based quantification. All protocol steps and quality checking with Agilent Bioanalyzer 2100 and gel electrophoresis (2% agarose) are schematically represented: starting material (RNA < 200 nt), the result of polyadenylation reaction with PAP, the synthesis of first-strand cDNA (peaks are associated to Oligo-dT15-T7 and SMART-16attB1-T3 primers) and the second-strand synthesis by PCR amplification. We have decided to block PCR reaction during the exponential phase at 22 cycles, to avoid distortion of the actual concentration of miRNAs in the sample under consideration. We have demonstrated that PCR cycles between 20 and 25 are sufficient to achieve a good level of amplification without reaching the plateau phase in which the expression differences would be invalidated (Figure 5A). Second-strand synthesis by PCR reaction. A)Determination of the optimal PCR amplification cycle: the 2% agarose gel shows the amplification products of RH30 first-strand cDNA stopped at 15, 20, 25 and 30 PCR cycles. B) Presence of specific miRNAs in the labeled cDNA population: the 2.25% agarose gel shows PCR amplification products of three specific miRNAs (miR-1, miR-206 and miR-450) performed by using the sequence of each miRNA as forward primer, and the sequence for T7 promoter, which is common to all labeled molecules, as reverse primer. Finally, to verify the presence of miRNAs within the labeled cDNA population we have identified, by PCR, three specific miRNAs (miR-1, miR-206 and miR-450) using the sequence of each miRNA as forward primer, and the sequence for T7 promoter, which is common to all labeled molecules, as reverse primer. The result of PCR amplification of the three miRNAs is shown in Figure 5B. Using the xMAP™ assay described above we have determined the expression levels of miR-23a, miR-27a and miR-199a in seven RMS cell lines (RD, CCA, SMS-CTR, RH36, RH18, RH4, RH30) in comparison to a reference sample consisting of a pool of small RNA from each cell line mixed in equal amounts. To evaluate the validity and feasibility of an assay, it is necessary to compare data with that obtained by other established technologies such as, in this case, microarray and qRT-PCR. As shown in Figure 6, the trends of expression levels measured for all the miRNAs by the three technologies (microarray, xMAP™ and qRT-PCR) were very similar. 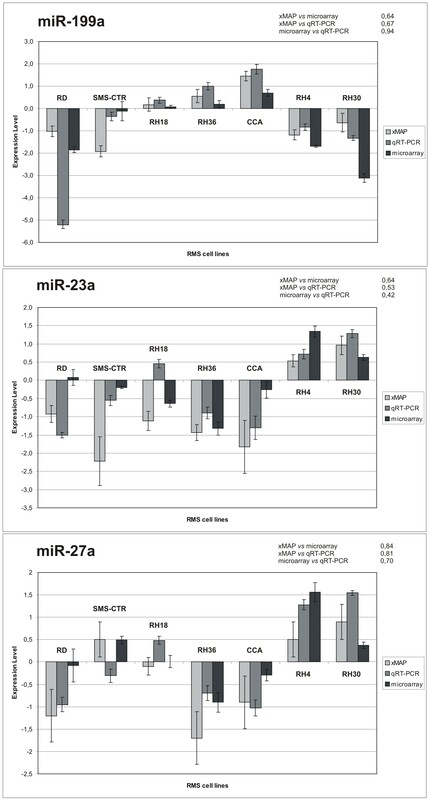 Although the actual values of the relative miRNA hybridization signals in the seven RMS cell lines were not exactly the same for the three technologies, up-regulated miRNAs (miR-23a and miR-27a) in PAX3-FKHR positive RMS samples (RH4, RH30) detected originally by microarray were also up-regulated as detected by xMAP™ and qRT-PCR, and signals for miRNAs down-regulated in PAX3-FKHR negative RMS samples (RD, CCA, SMS-CTR, RH36, RH18) resulted consistently low by all three independent technologies. To better understand which are the techniques that provide the most similar results we have applied non-parametric Spearman correlation to the following paired comparisons for each tested miRNAs: xMAPTMvs. microarray, xMAPTMvs. qRT-PCR and qRT-PCR vs. microarray. It is interesting to note that data obtained with xMAP™ technology seem to be more similar to those defined by microarray (Spearman correlation: miR-199a = 0.64, miR-23a = 0.64, miR-27a = 0.84) respect to qRT-PCR (Spearman correlation: miR-199a = 0.67, miR-23a = 0.53, miR-27a = 0.81). From this comparison we could observe that the PCR amplification step introduced in xMAP™ labeling method does not affect miRNA expression levels whereas miRNA expression data obtained from < 200-nt RNA molecules (microarray and xMAP™) differ slightly from those obtained from total RNA (qRT-PCR). This is particularly evident by non-parametric Spearman correlation for qRT-PCR vs. microarray (miR-199a = 0.94, miR-23a = 0.42, miR-27a = 0.70) with the exception of miR-199a. 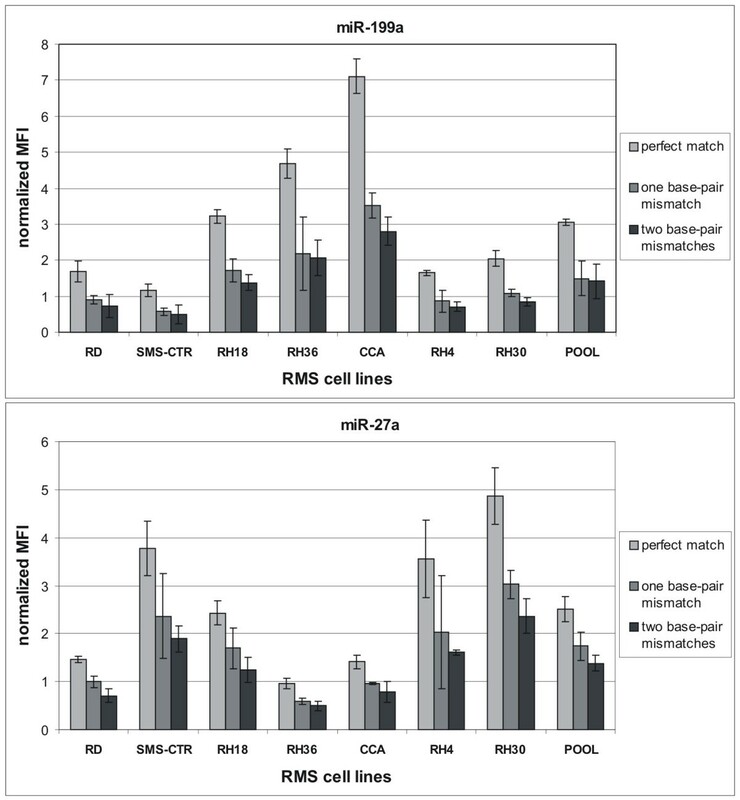 Comparison of three different techniques used to define miRNA expression profiles in seven RMS cell lines. Expression levels of miR-199a, miR-23a and miR-27a in seven RMS cell lines obtained with three methods (xMAP™, qRT-PCR and microarray) are represented. Mean value of expression and 95% confidence intervals are associated to each miRNA. The Figure also indicate, for each tested miRNAs, non-parametric Spearman correlations for the following paired comparisons: xMAP™ vs. microarray, xMAP™ vs. qRT-PCR and qRT-PCR vs. microarray. We have described a new method that makes use of xMAP™ technology for the quantitative determination of single miRNAs. This approach quantifies miRNA expression levels based on hybridization of small RNA populations to the probes designed for miRNAs of interest that are coupled to different color-coded microspheres. A flow-cytometer is used to simultaneously measure the hybridization signal associated with the surface of the microspheres and to categorize the color-coded microspheres. The method allows to obtain up to 100 independent measures. This xMAP™ method offers affordable cost, speed, and high flexibility with capability for multiplexed assays that are increasingly needed. It is valuable for applications such as diagnostic detection of disease miRNAs from clinical samples and validation of differentially expressed miRNAs obtained from microarray analysis. We have evaluated the stability of conjugated microspheres demonstrating that they are stable for about one month. We have also tested the specificity of hybridization between targets and capture probes showing that the introduction of a single mismatch in the sequence of capture probes significantly hampers its hybridization capacity (Figures 2 and 3). These data have demonstrated the specificity of our capture probes to correctly identify and quantify the expression levels of miRNAs. We have developed a new sensitive small RNAs labeling protocol introducing some changes on mRAP strategy for miRNA cloning. This protocol has been applied successfully to validate the expression levels of three miRNAs that were found differentially expressed in positive and negative PAX3/FKHR alveolar rhabomyosarcomas by microarray experiments. To demonstrate the reliability of this method, the transcriptional levels of these miRNAs were also determined by qRT-PCR with TaqMan probes. The most significant information which emerges comparing the data obtained by the three different technologies (microarray, xMAP™ and qRT-PCR) is represented by the general overlapping of the expression profiles obtained. It is interesting to note that small differences in miRNAs expression data could depend on the approaches used for total RNA purification rather than on different labeling protocols. In fact, microarray and xMAP™ data obtained from labeling < 200-nt RNA molecules, are more similar compared to qRT-PCR data obtained from labeling total RNA, as demonstrated by the Spearman non parametric correlation. We think that the xMAP™ technology associated with our new labeling protocol could become an alternative and equally reliable method in the study of expression of a limited number of miRNAs respect to qRT-PCR with TaqMan probes. The comparison of the two experimental approaches (see Table 2) shows that the xMAP™ technique is less expensive and more flexible allowing the simultaneous analysis of a larger number of miRNAs from the same sample. In addition, xMAP™ does not need for specific reverse transcription reactions for each miRNA and provides at least 100 independent measures for each miRNA, improving the statistical power. Moreover, xMAP™ expression data can be normalized respect to a spike fluorescence signal added in known quantities in the early stages of the labeling reaction, allowing the control over all stages of the reaction. In this way there is no need of an endogenous control, like in qRT-PCR, whose representativeness is sample-dependent. Probably, a negative aspect of xMAP™ technology is represented by the use of enriched total RNA ( < 200 nt) that requires higher amounts of starting material respect to qRT-PCR. To avoid the enrichment step of < 200 nt RNA molecules, we propose the use of LNA capture-probe oligonucleotides that increase the affinity of the oligonucleotide for its complementary RNA target leading to a significant enhance in stability and specificity of the duplex. We think that the technology we have developed could be an alternative method to qRT-PCR for validating miRNAs expression data obtained with a large scale technology such as microarray and it could have a wide application in clinical, pharmaceutical, agricultural and environmental studies. Human alveolar RMS (ARMS) cell lines, positive for PAX3-FKHR translocation (RH4, RH30), negative for PAX3-FKHR translocation (RH18) and human embryonal RMS (ERMS) cells (RD, RH36, CCA, SMS-CTR) were maintained in modified Eagle's medium (DMEM) containing 10% fetal calf serum, penicillin (100 U/ml), and streptomycin (100 μg/ml) (Invitrogen) at 37°C, 5% CO2 in a humidified incubator. The human RMS cell lines RH30 and RD were purchased from ATCC (Manassas, VA); RH4 and RH18 were a gift of Dr P.J. Houghton (St Jude Children's Hospital, Memphis, TN); SMS-CTR, RH36, CCA were obtained from Dr M. Tsokos (NCI, Bethesda, MD). Total RNA was prepared from seven cell lines of human rhabdomyosarcoma using a modified TRIzol (Life Technologies Corporation, Carlsbad, CA, USA) protocol for small RNA enrichment. A pellet of about 6 × 106 - 9 × 106 cells was dissolved in 1 ml of TRIzol and the supernatant, containing total RNA, was purified by PureLink™ miRNA Isolation Kit (Life Technologies Corporation) that was specifically designed to enrich total RNA preparation for < 200-nt RNA molecules. RNA quantity and quality were assessed by Nanodrop (NanoDrop Technologies, Wilmington, DE, USA) spectrophotometry and microelectrophoresis using Small RNA Nano LabChip by Agilent 2100 bioanalyzer (Agilent Technologies, Palo Alto, CA, USA) respectively. microRNA expression profiling was carried out using the "mirVana Probe Set V1" (Ambion) that is a collection of about 400 amine-modified DNA oligonucleotides representing a panel of the human, mouse and rat microRNAome in the miRNA Registry (miRBase - Release 9). The probes are 42-46 nucleotides (nt) long, with 18-24 nt segment targeting a specific miRNA, and the remaining sequence serving as spacer. We analyzed the expression profiles of 7 different rhabdomyosarcoma cell lines: 3 ARMS (RH4, RH30, RH18) and 4 ERMS (RD, RH36, CCA, SMS-CTR). The miRNA population from each cell line was compared to a reference sample consisting of a pool of the 7 total RNA samples mixed in equal amounts. Two replicates of each experiment were performed using different microarray slides, in which sample and reference RNAs, labeled either with Cy3 or Cy5 fluorochromes, were crossed in both combinations (dye-swapping procedure). miRNAs were labeled with the mirVana Labeling Kit (Ambion) and amine-reactive dyes (GE Healthcare) as recommended by the manufacturer's protocol . Normalization of expression levels of all spot replicates was performed by MIDAW . Principal component analysis, cluster analysis and profile similarity searching were performed with tMev software . One and two class Significance Analysis of Microarray (SAM) allowed to identify differentially expressed miRNAs . A sequence of 21-23 nt complementary for each tested miRNAs (listed in the Table 1) was chosen as capture probe and synthesized with 5'-amino linker and a C12 spacer (PRIMM, Milan, Italy). Capture-probe oligonucleotides were covalently linked to carboxylated fluorochrome microspheres (Bio-Rad Laboratories, Hercules, CA, USA) in water-soluble carbodiimide. Specifically, 1 × 106 carboxylated microspheres were pelleted in a microcentrifuge for 5 minutes at 12,000×g and then supernatant was carefully removed. The dry microspheres were dissolved in 20 μl of a buffer containing 0.1 M MES (Sigma-Aldrich, St. Louis, MO, USA) at pH 4.5. The amino-substituted capture probe was dissolved in molecular biology grade water at a concentration of 100 μM and 0.5 μl of the solution (containing 0.05 nmole of capture probe oligonucleotides) was added to the beads for the coupling reaction. The coupling reaction was performed by adding 2.5 μl of a freshly made solution of 10 mg/ml 1-ethyl-3-(3-dimethylaminopropyl) carbodiimide hydrochloride (EDC)(Pierce, Thermo Scientific, Wilmington, DE, USA) in molecular biology grade water. The mixture of microspheres, capture probes, and EDC was vortexed briefly and incubated at room temperature for 30 minutes in the dark. Occasionally, the reaction was mixed by finger flicking the tube to keep the microspheres in suspension. A second incubation steps was done adding a freshly-made solution of 10 mg/mL EDC in molecular biology grade water. After the coupling reaction, 500 μl of 0.02% Tween 20 (Sigma-Aldrich) was added to the microspheres. The solution was mixed well by vortex and centrifuged for 6 minutes at 12,000×g. The supernatant containing free-capture-probe oligonucleotides and excess EDC was carefully removed. The coupled microspheres were washed in 500 μl of 0.1% SDS (Sigma-Aldrich) by vortex and centrifuged for 5 minutes at 12,000×g. Finally, the supernatant was removed and the capture-probe conjugated microspheres were resuspended in 20 μl of TE pH 8.0 and stored at 4°C in a dark box (stable for at least 6 months). The microspheres were diluted in TE buffer and counted using a Bürker chamber under the microscope at 100× magnification. At the beginning, 1 μg of small RNA molecules (< 200-nt) and 200 pg of a synthetic pre-labeling control RNA (5'-UCUUAGUCUUGAUUGUGGCAAUG-3', PRIMM) were mixed in order to control target preparation efficiency and to normalize expression data. The mixture was polyadenylated using Poly(A) Tailing Kit (Ambion) according to the manufactures' instructions. The reaction was precipitated with NaOAc 3 M pH 5.5 (1/10 volume) and absolute ethanol (4 volumes) overnight at -20°C. The polyadenylated RNA molecules were resuspended in 15 μl of H2O RNase free and then volume was reduced to 3.2 μl by vacuum (VR-1, Heto-Holten, Denmark). miRNAs labeling was performed by mRAP modified protocol in which miRNA-derived cDNAs were flanked by synthesized oligomers at each end. The SMART (switching mechanism at the 5'-end of RNA templates of reverse transcriptase) oligo sequence (SMART-16attB1-T3: 5'-TACAAAAAAGCAGGCTAATTAACCCTCACTAAAggg-3') and the overhang of the oligo-dT15-T7 primer (5'-GTGAATTGTTAATACGACTCACTATAGGCGC [dT]15N-3') were used for first strand synthesis. First strand cDNA synthesis was performed from 500 ng of small RNA in a 10 μl reaction. Then, the reaction was diluted 1:2 and incubated at 72°C for 7 min. Second strand reaction mix was added to 3.0 μl of diluted first strand cDNA to give a final concentration of 1X BD Advantage 2 PCR reaction buffer (Clontech Laboratories, Mountain View, CA, USA), 0.2 mM dNTPs, 100 nM primers (T3-biotinylated forward primer: 5' - biotAATTAACCCTCACTAAAGGG-3' and T7 reverse primer: 5'-TAATACGACTCACTATAGG-3') and 1X of Advantage 2 DNA polymerase mix (Clontech Laboratories) in a total volume of 25 μl. This second strand reaction mixture was incubated for 22 cycles of the following steps: 15 sec 95°C, 20 sec 51°C and 20 sec 72°C. Only those ss cDNAs having a SMART anchor sequence at the 5'-end were used as template and exponentially amplified. The second strand reaction was precipitated in sodium acetate-ethanol solution and dissolved in 11 μl TE buffer pH 8.0 (10 mM TrisHCl pH 8.0, 1 mM EDTA). 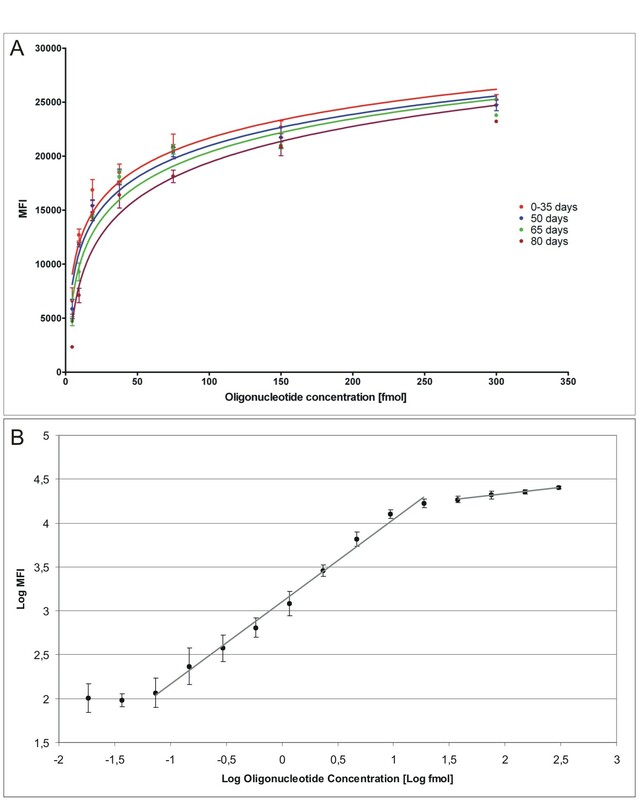 Biotinylated cDNA quantity was assessed by Nanodrop spectrophotometer (Nanodrop Technologies) and stored at -20°C until hybridization with microspheres. Labelled target produced by a single PCR reaction was sufficient for two hybridization reactions. The microspheres of each probe set were resuspended by vortexing for approximately 20 seconds. A microsphere mixture was prepared by diluting coupled stocks to 150 microspheres of each set/μl in 1.5× TMAC Hybridization Buffer (5 M tetramethylammonium chloride, 0.15% Sarkosyl; 75 mM Tris-HCl pH 8.0; and 6 mM EDTA, pH 8.0), followed by vortex mixing for approximately 20 seconds. Two μg of biotinylated DNA target in 17 μL of TE buffer pH 8.0 was added to 33 μl of microsphere mixture (approximately 5,000 beads per color) in the wells of a 96-well plate. 17 μl of TE buffer pH 8.0 were added to background wells. Each well reaction was mixed gently by pipetting up and down several times and the labeled DNA was denatured by heating at 95-100°C for 3 min. The hybridization mixture was incubated at 48°C for 17 h, covering the plate to prevent evaporation, in a Eppendorf microplate incubator with shaking speed of 700 rpm. After incubation, the hybridization mixture was spun down for 3 min at 3,000×g to pellet the microspheres. Supernatant was carefully removed with a pipette without disturbing the microspheres. During centrifugation, fresh reporter mix was prepared by diluting streptavidin-conjugated R-phycoerythrin (Invitrogen) to 3 mg/ml in 1× TMAC Hybridization Buffer and 75 μl of reporter mix were added to the microspheres. The solution was gently mixed by pipetting and incubated in the dark at 48°C for 15 minutes in a Eppendorf microplate incubator. 50 μl of each sample were transferred to a Multiscreen HTS plate (Millipore) and analyzed on the BioPlex™ (Luminex® 100™, BioRad) machine at hybridization temperature. Each set of microspheres was distinguished by assigned colour code (different percentage of red and orange) inside the microspheres. In our experiments we have used four different probe sets (regions: 1, 21, 51 e 57). The fluorescence associated to the surface of each bead, corresponding to the amounts of bound miRNAs, was detected and measured by the laser detector. The Bio-Plex™ (Luminex® 100™, Bio-Rad Laboratories) system detects fluorescent dyes with an excitation wavelength of -532 nm and emission wavelength -580 nm. For each experiment, 100 events of each subset of microspheres were analyzed on the Bio-Plex™ system to obtain a median fluorescence intensity value (MFI) that was representative of the whole population of each set of beads. To eliminate bead-specific background, the reading of every bead for every samples was first processed by subtracting the average readings of that particular bead in the absence of target miRNAs. Samples with median fluorescence intensity values smaller than background signals were removed. Every samples was assayed in three wells. Each of the three wells contained 4 probes: miR-23a, miR-27a, miR-199a and one pre-labeling control (Spike-18). Expression data were scaled according to the pre-labeling control in order to normalize readings from different probe/bead sets for the same sample and to normalize for the labeling efficiency. Technical replicate samples for each probe were summarized by their mean profile and expression data (test/control) were log2 transformed. The error associated to each probe is obtained by quadratic propagation from standard deviation. TaqMan® MicroRNA Assays incorporate a target-specific stem-loop, reverse transcription primer. The stem-loop structure provides specificity only for the mature miRNA target and forms a RT primer/mature miRNA-chimera that extends the 5'-end of the miRNA. The resulting longer RT amplicon presents a template amenable to standard real-time PCR using TaqMan Assays . In brief, according to the manufacture's instructions (Applied Biosystems), each 15 μl RT reaction contained purified 10 ng of total RNA, 3.0 μl of 5× stem-loop RT primer, 1× RT buffer, 0.25 mM each of dNTPs, 50 U MultiScribe™ reverse transcriptase and 3.8 U RNase inhibitor. The reactions were incubated in a Mastercycler EP gradient S (Eppendorf) in 0.2 ml PCR tubes for 30 min at 16°C, 30 min at 42°C, followed by 5 min at 85°C, and then held at 4°C. RT products were diluted two times with H2O prior to setting up PCR reaction. Each real-time PCR for each miRNA assay (10 μl volume) was carried out in triplicate, and each 10 μl reaction mixture included 1 μl of diluted RT product, 5 μl of 2 × TaqMan® Universal PCR Master Mix and 0.5 μl of 20× TaqMan® MicroRNA Assay. The reaction was incubated in a 7500 Real-Time PCR System (Applied Biosystems) in 96- well plates at 95°C for 10 min, followed by 40 cycles of the following steps: 95°C for 15 sec and 60°C for 1 min. The threshold cycle (CT) is defined as the fractional cycle number at which the fluorescence exceeds the fixed threshold of 0.2. To evaluate differences in miRNA expression, a relative quantification method was chosen where the expression of the miRNA target is standardized by a non-regulated small non-coding RNA used as reference. Consequently, three replicates of each sample and endogenous control were amplified. U6B small nuclear (RNU6B) was used as endogenous control because the level of this small RNA remains essentially constant from sample to sample. To calculate the relative expression ratio, the 2-Δ ΔCt (RQ, relative quantification) method implemented in the 7500 Real Time PCR System software  was used. This method determines the change in expression of a nucleic acid sequence (target) in a test sample relative to the same sequence in a calibrator sample. This work was supported by Associazione Italiana per la Ricerca sul Cancro (AIRC) and Biotech Action III bis (CIPE 3/06 DGR 4073 19/12/2006 Veneto Region). The authors wish to thank Emanuele Papini, Paola Cecchini and Regina Tavano (Dept. Biomedical Sciences and C.R.I.B.I. Biotechnology Centre-University of Padova, Italy) for technical support in bead-based detection with BioPlex. We are also grateful to Angelica Zin for RMS cell lines. AB performed small RNA molecules isolation, capture probes coupling to microspheres, miRNA labeling method, bead-based detection with BioPlex and computational analyses (data processing and quality control). SC performed RMS cell lines culture, small RNA molecules isolation, microarray experiments and qRT-PCR validation. SC participated in conceiving the study and in development of miRNA labelling method. LT performed RMS cell lines culture and participated in total RNA extraction. AR provided RMS cell lines and revised the manuscript. GL supervised the study, participating in the design and coordination of the work, the interpretation of the results and revision of the manuscript. CDP conceived and supervised the study, participating in the design and coordination of the work, the interpretation of data and manuscript writing. All Authors read and approved the final version of the manuscript declaring that they have no potential conflicts of interests.